There are thousands of gi models available in the market today that offers a range of novel and creatively designed fight wear. However, the JACO Unity Lightweight Gi provides one of a kind weave design compared to other models. Not only that – this gi also has some great looking design elements that make it a unique and special gi model. Disclosures: This is a product review based on my own opinion. I have no business or any personal connections to the seller of this product. I have talked to a lot of people who were aware of the brand and have personally tried JACO gi models and one thing I have gotten out of their reactions overall is this: JACO offers high-quality made products capable of meeting the demands of every gi user. The company continuously produce numerous numbers and more established gear models today so I won’t be surprised if one day they become the number one bestselling brand in the world. Just like other brands, JACO started by offering a small range of Gi’s and other items. 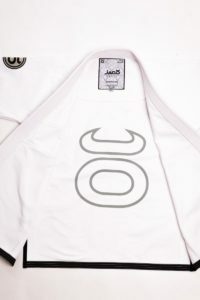 I finally was able to get a trail of one of their products the JACO Unity Lightweight Gi with A2 size. This is my review with regards to how the gi has fared after using it in my series of training. Mild shrinkage of sleeves (very mild), I didn’t notice any other shrinkage. When I got this gi, I got really impressed with how nicely done and cool the styling elements are on the fabric. They were not too distracting, easy in the eyes, and they were simple but elegant. I am amazed by how smooth the 350 GSM Pearl Weave Jacket is. It feels really nice on the skin and since the shoulder yoke made of cotton material, it makes it even more comfortable to wear. I’m also glad that it’s all cuff and seam taping because there’s no scratchiness and it adds to the comfort as well. Since it’s a pearl weave jacket, it’s very densely woven making the material feel stiffer and less flexible compared to other gi jackets in the market. The A2 size I got was surprisingly roomy than what I expected so it gave me more freedom to move around without being scared of it ripping off while on training or while washing it. I got used to using brands that overly fit that I didn’t realize, a wider and looser gi for my torso or my physique is all that I needed. The strength yet lightness of the pants is due to the fact it’s made of a medium weight cotton twill. The pants are plain, nothing special about its design, but the material gives me comfort and assurance that it will last longer than other brands. If you have thick thighs, you’ll definitely appreciate the roomy pants just like the jacket as it will also give you the freedom to do any movements you want. I’ve had stretchy gi pants before but the ripstop pants of this gi move very well. I don’t have thick thighs so the trousers are cut very straight just like judo trousers but nothing beats comfort and ease when it comes to purchasing a gi gear. A lot of people, however, argue that a wider trouser leg opening gives the opponent a chance to grab a bit more material than they usually can. This is something you do need to consider when purchasing this gi model for yourself or for someone else. I also want to specifically talk about the durability of this gi. For all the rolling, kicking, and striking I have been doing while wearing this for a few weeks now, the construction is just so high quality that I don’t think I’ll have problems wearing it for a long time. The tenacity logo inside the jackets adds to its uniqueness and since it’s an IBJJF compliant, I know I’m getting the exact quality standards required from JACO and all other gi manufacturers. It’s really the gi design and the cool graphical elements that made me feel excited about this JACO Unity Lightweight Gi. I’ve never been into wearing flashy, too-in-your-face gi designs so this model is really awesome in my own perspective. Even with its simple graphics, it’s stylish enough to get noticed when you wear it in public. Less is more so I’m glad the embroidery of this gi is relative subtle at it is important for me as well. Furthermore, if the fabric of this gi wasn’t densely woven and seems to ‘breathe’ just like other low quality made gi, I don’t think I would even purchase it at all. Its ability to trap the heat coming from your body makes it perfect for winter season. Wearing it in summer may not be very pleasant but if you’re in an air-conditioned training room, it really won’t feel anything different regardless of the weather. However, if you sweat a lot, you may notice the gi gets pretty wet really fast so it could get a bit heavy during a very a heavy session so makes sure you also consider this before making a purchase. In conclusion, this is a smart looking gi, made with high-quality materials which makes it more durable compared to other brands. This gi most importantly provides the perfect combination of fit and comfort from both the jacket and pants which is crucial for peak competitive performance during training. It has the quality standards JACO is known for making it ideal for both amateur and professional athletes.